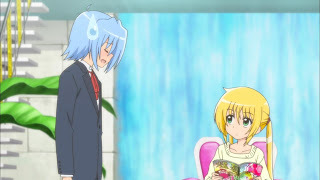 Risa corners Hayate at a vending machine and steals his milk while complaining about how everyone considers herself, Miki, and Izumi as idiots. 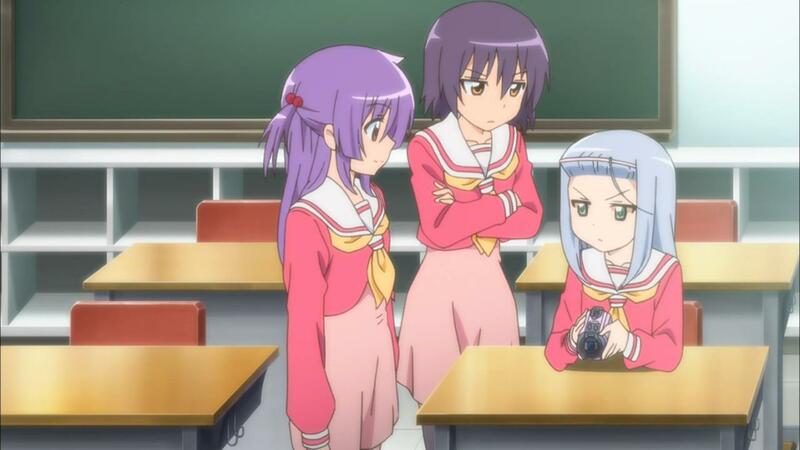 The other two “idiots” show up when Hayate agrees with the assessment. They want to prove they aren’t morons, so they decide to each create a video and upload it to the Web to see which video will get the most hits, proving that person isn’t an idiot. Izumi is doing a time-laps movie of a plant growing. She breaks the plant, so Rika reveals she’s going to record chicks hatching. Since she used unfertilized eggs from the supermarket, her video is a fail, so Risa reveals her Rube Goldberg machine. However, she activates it without recording it, so it fails, revealing that all three are idiots. 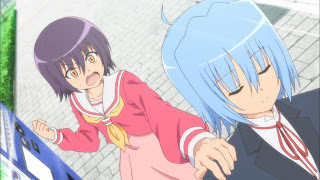 Risa corners Hayate in the halls of school after Hayate only gives her a birthday greeting but no present. After making a fuss, he gives her a bookmark he’d made. 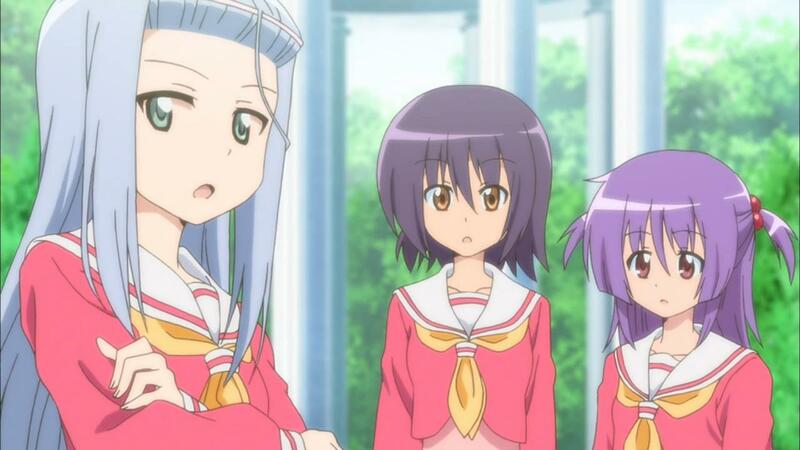 Risa is not pleased, especially since Hayate gave proper presents to Izumi and Miki. 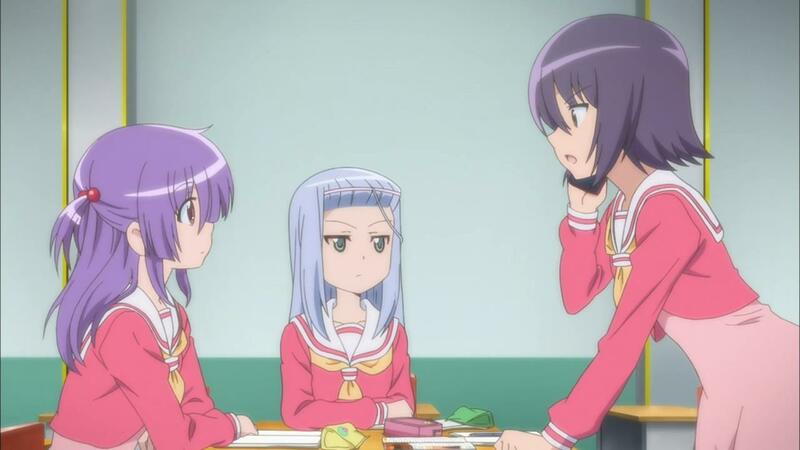 After consulting with her comrades and determining it is cuteness that makes the difference, Risa gives a call to Hina, who tells her to get studying. She calls Nagi, who suggests blushing girls are cute. 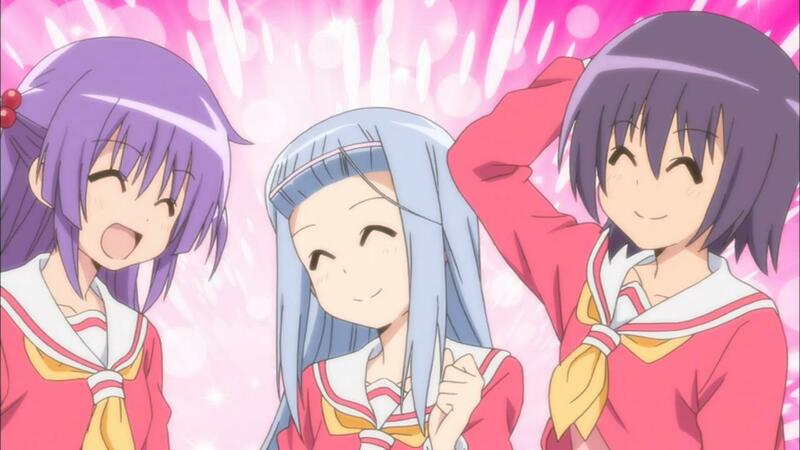 With Hayate in the room with them, Risa gets Izumi to lift her skirt and blush, revealing her cuteness. Yukiji enters to give the three idiots a makeup test, but they’ve been goofing off instead of studying so they aren’t ready. Yukiji hands class president Izumi some printouts for the class, warning her that there’s only one per person. Izumi gets distracted by Shiranui and ends up losing some printout pages. As a result, she’s stuck cleaning the classroom alone. Shiranui shows back and and in the process, Miki’s video camera falls to the floor. Testing it to make sure it isn’t broken, Izumi makes a quick video. Because it is fun, she makes another one, making her brother-butler. Then, she makes an embarrassing video as if she’s the heroin of a shoujo manga in a romance scene with a boy. She realizes it is getting late and leaves without deleting the video. The next day, Miki scolds Izumi for leaving her camera in the classroom. Risa teases her about possibly recording stuff. 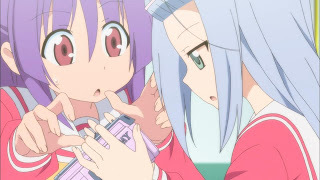 Izumi panics, but Miki discovers that the SD card is missing. For those curious, this episode is adapted from manga chapter 356 (volume 33), chapter 373 (volume 35), and chapter 308 (volume 29) (with the splash page of chapter 309 thrown in to show who helped Izumi). Of all the episodes so far, I find it interesting that this one takes from more recent manga chapters. Whatever thoughts I had about the individual stories can be found in the links citing the manga chapters. The only thing I’d add is that for this episode, Miki’s SD card is missing. In the manga, the card has only been reformatted, thanks to Hayate. The only other thing I’d like to say is that this episode showed how the three “idiots” are only used as side story fodder, or to stir the pot with Hina, Nagi, or the like. Beyond that, I really can’t offer any commentary about this episode. I’m just so disappointed with this series so far, I find it hard to be enthused about it. But, I plan to continue to the end. Doesn’t Shiranui belong to Nagi? Why is Shiranui at the school? On a random side-note, you might be interested in watching Hataraku Maou-sama, one of the best currently airing anime series. It’s an… interesting take on heroes and evil demon lords. In present day Japan. 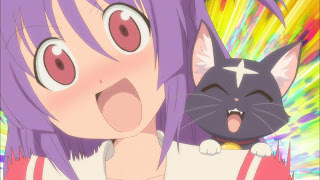 And may I suggest for other great works of shonen day, wich it also make a cameo in this episode is The world god only knows. I like your blog so I was hoping what your opinion of TWGOK is! >On a random side-note, you might be interested in watching Hataraku Maou-sama, one of the best currently airing anime series. >Seeing that you like hayate no gotoku you will probaly like TWGOK too. Yeah, I’ve heard of it. I haven’t done more than that. 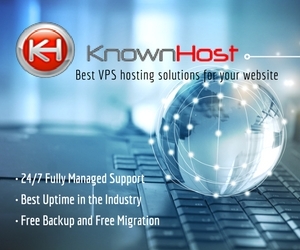 Is a publishing house printing it in the U.S.? It looks like they havent bring the manga over to the U.S. , but the anime is lincensed by Sentai Filmworks. If the manga was avaible in English I would have bought them all just to support the mangaka.